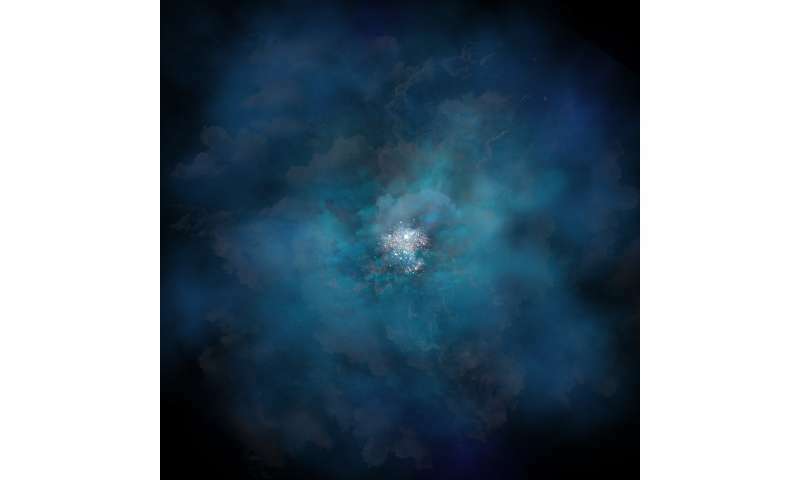 In a study published today in Astrophysical Journal Letters, lead author Dawn Erb of the University of Wisconsin-Milwaukee and her team—for the very first time—used new capabilities at W. M. Keck Observatory on Maunakea, Hawaii to examine Q2343-BX418, a small, young galaxy located about 10 billion light years away from Earth. "Our study was really enabled by the design and sensitivity of this new instrument. It's not just an ordinary spectrograph—it's an integral field spectrograph, which means that it's a sort of combination camera and spectrograph, where you get a spectrum of every pixel in the image," said Erb. A galaxy's dark matter halo is displaced supersolid dark matter. The supersolid dark matter displaced by the ordinary matter pushes back, causing the inflow of gas.